Next up we made the move to Copenhagen in Denmark. I think it’s probably the most expensive place I've ever been! In saying that the supermarket sells craft beer which is a plus and there are a number of excellent craft beer venues in and around the central part of the city. Our trip to the supermarket was sooner than anticipated due to a torrential downpour on our way from the train station to our hotel. 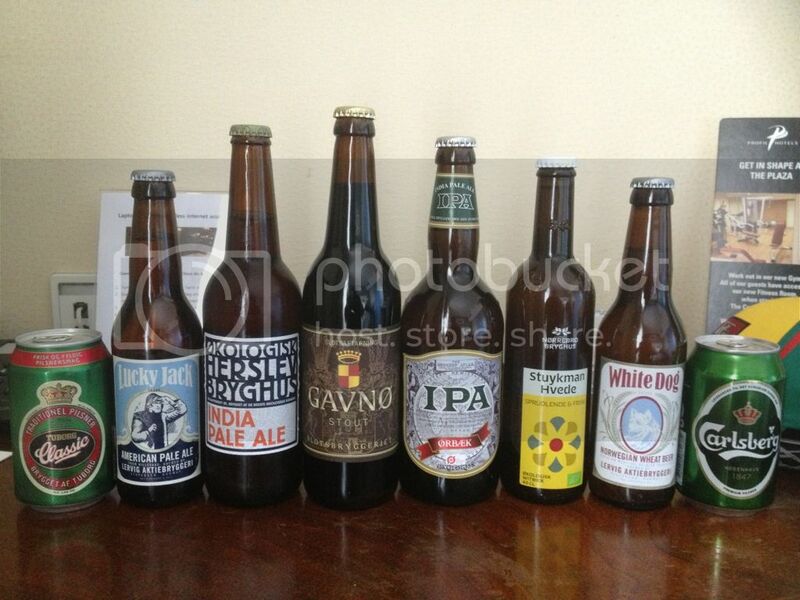 My selection of 8 beers encompassed the big two Danish lagers & Danish and Norwegian craft beers. 2 IPA’s, 2 wheat beers, the trip’s first stout, an American pale ale and 2 lagers. A pretty diverse selection but are any of them any good? “Probably the best beer in the world” is a slogan that I think everyone is familiar with. Carlsberg is the national beer of Denmark and one of the world’s most recognisable brands. Unfortunately for Carlsberg this slogan is far from true but it is still a drinkable macro lager. A beer that I think everyone should try even if it’s just to say you have. 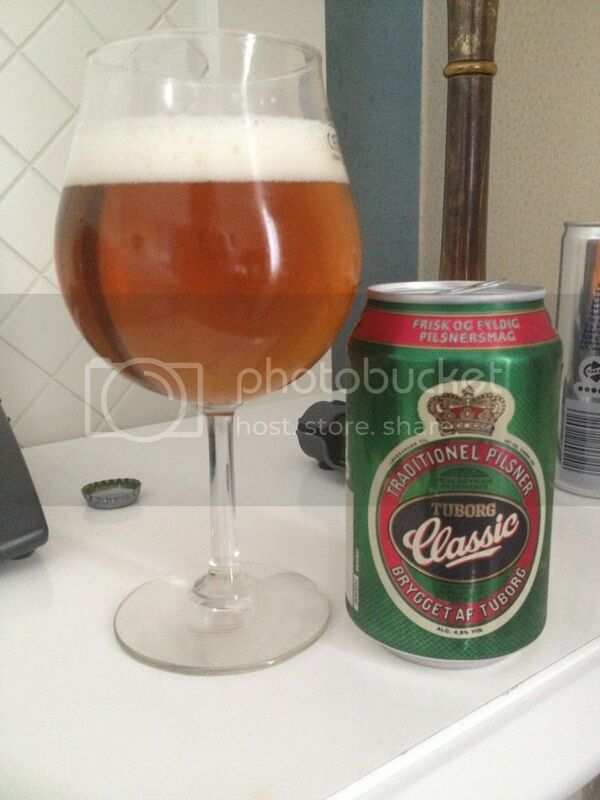 Tuborg Classic was the next beer I tried, purely because I’ve had Tuborg Green and enjoyed that so wanted to see how their Pilsner was. The answer; better than I expected with the grassy hops quite prevalent for a macro lager, you could do much worse than this beer if you are a lager drinker in Copenhagen. My first IPA in over 2 weeks was a real let down. 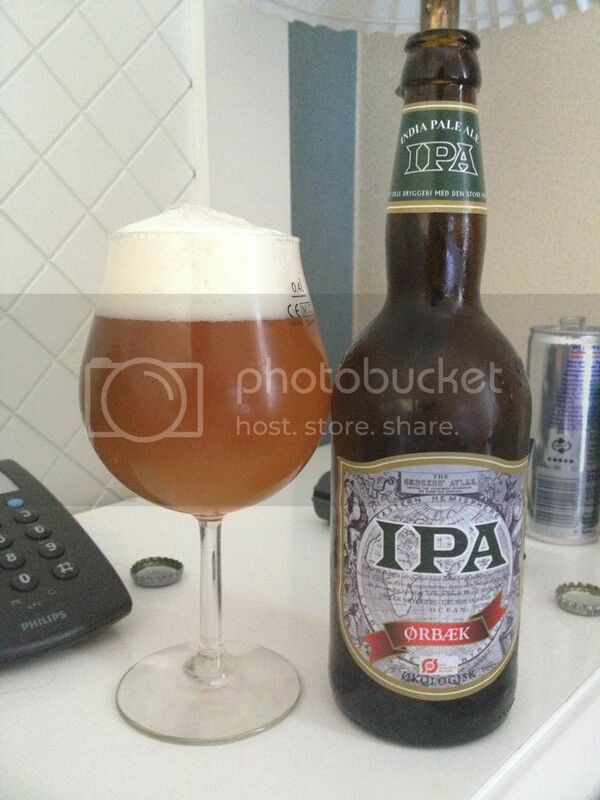 Don't get me wrong Ørbæk Bryggeri IPA is a nice beer, only issue is it's not an IPA! This is nothing more than American Pale Ale. Beer style disappointment aside it was very drinkable and at 5% I'd be happy to drink it as a session beer. It reminded me of Stone & Wood Pacific ale, but was a vastly different beer. Confused? So am I, but we'll leave this one here. The second (well really first) IPA, Økologisk IPA from Herslev, was better although not a lot... I say that but I suspect I was being hyper-critical/drunk at the time I reviewed it. It was an English style IPA, which are never my favourites, and it's hop use was minimal if I'm being kind. Although I do remember finishing this off quite quickly and not being overly disappointed in it, I just don't have the tasting notes to back it up. 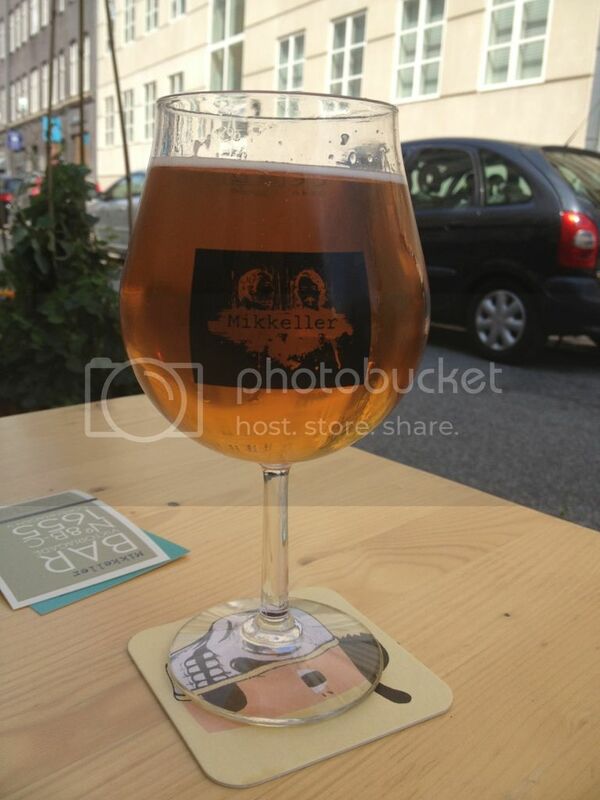 My quest to find a good IPA in Copenhagen was finally solved when we stumbled upon the Mikkeller Bar in Vesterbro. To say this was the find of the trip so far would be an understatement! Not only do they serve amazing beers, they are also the cheapest place we found in Copenhagen. Two visits over two days shows how much of a hit this place was with us. The hardest part of the Mikkeller bar was finding beers that would be palateable to Lizzie’s decidedly hop-phobic tastes. To my absolute astonishment when she tasted my BetelGueuze she announced that she liked it! Further amazed was I when she proceeded to go to the bar, order herself one and finish the whole thing! Who’d have thought?!? Back to the bottled beer and I have to say the rest were significantly better than the two IPA’s preceding these. The Gavno Stout had excellent flavour, but unfortunately the mouthfeel was a little too thin. While the Nørrebro Stuykman Hvede had a really excellent spicy nose and flavour, it's certainly a beer I'd try if you can get your hands on it. The two Norwegian beers, from Lervig Aktiebryggeri, were both well-constructed examples of their styles. 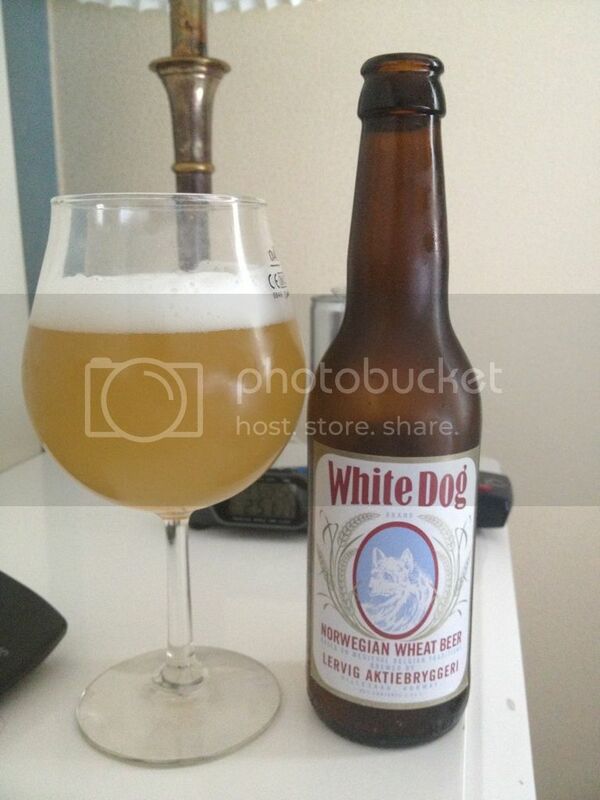 The White Dog (pictured) was one of the best technical Witbiers that I've had in a long time and the Lucky Jack was a very refreshing pale ale with plenty of citrus flavours. This is a beer I'd love to be able to get my hands on again to do a full review with. So what to say about beer in Copenhagen? It was a bit of a mixed bag, and probably not quite worth the price that many places try and charge. For value for money go to Mikkeller bar where you can get an 0.4L of something good for less than an 0.5L of Carlsberg at a restaurant or pub. As for the bottles, I’m afraid to say but I think it may be better to stick to Norwegian craft beers. The ones I had were just a class above the Danish ones although I will admit my selection probably had something to do with that… Anyway onto the next country! P.S. I should also have mentioned that we visited Brygerriet Apollo in Copenhagen and had a fantastic steak and their own pilsner, brewed in-house. This was an awesome lunch venue that'd I'd definitely recommend.